Made at Vero's Kitchen | International food made at home. International food made at home. A couple of months ago my Uruguayan friends, Helen and Fernando, who live in Japan, visited us for a few days with their son Nico, who is a cutie. We had delightful time together and cannot wait to see them again. Helen and Nico were making a stop in Miami in their way home to Japan from a visit to their native Uruguay, and brought some delicious barbecue provolone, salami and chocolate Easter eggs. Fernando met them in Miami and brought with him a number of Japanese goodies that we savored slowly, to not run out of them so quickly. In our home we are definitely fond of Japanese food and these gifts are highly appreciated. In those days they spent with us we ate lots of meat, as it is not customary in Japan to eat the quantities and cuts of beef we do in America. 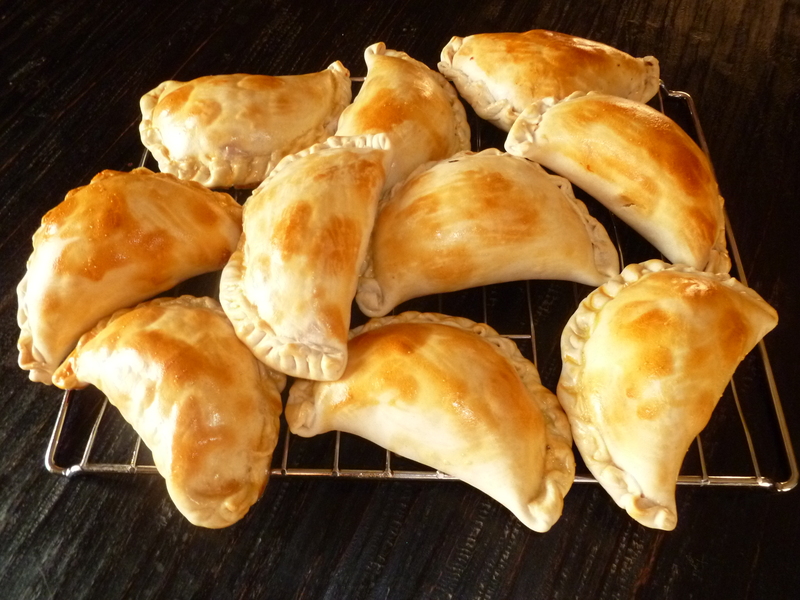 Fer (short for Fernando) made grilled steaks over charcoal and Helen prepared these meat turnovers in which, I ended up sticking my hands into in order to learn how to do repulgue. Repulgue is the technique used to close and seal the turnovers. We used frozen dough for these, but I hope one day to learn how to make them with homemade dough. This recipe yields about 10 turnovers. Dice the peppers and onion finely. Heat two tablespoons of olive oil in a skillet and add the peppers and onion and sautee. Add meat and sauté until browned. Add oregano, tomato sauce, sugar, salt and pepper. Cover the skillet and cook until the sauce is dry, about 5 minutes over medium heat. Remove from the heat and let it cool for about half an hour. Take the dough out of the freezer and let it thaw. Boil three eggs, until they are hard. Let them cool, peel and chop them into small pieces. Chop the olives in wheels or dice them, as you prefer. Beat the remaining egg in a small bowl and set some water at room temperature in another bowl. Place half of the dough discs in a large and flat tray. Make sure the tray is heat resistant and preheat the oven to 350° F.
Mix the chopped boiled eggs, olives and meat. Place a couple of tablespoons of the meat mixture in the middle of each disc, leaving the edges free, as you should lightly dampen the edges with water to make them stick together when folded. (In the picture below you can see several types of repulgue techniques.) Dampen and close the discs, one at a time. Repeat the same procedure for the remaining discs. Once assembled, brush the discs over with the egg mixture, only on the side facing up. P.S. Thanks to Aymara (Tirijala) for the translation. Mexican food is known for its rainbow of flavors, vibrant colors and diversity of spices and ingredients, most of which are native to the country. 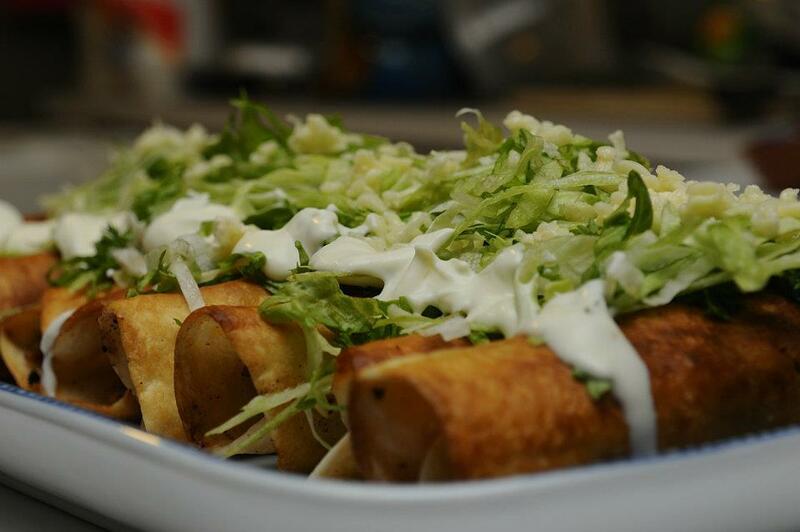 This Mexican dish takes its name from its looks: flautas or flutes, for their cylinder like shape, but depending on whether you use flour or corn tortillas, they are referred to as either palomas (flour), or flautas (corn). Back to the wonderful Mexican cuisine, this time I’d like to feature pork tenderloin, the ingredient of the week. Martha Chapa also shares this recipe in her cookbook, “La nueva gran cocina mexicana” (New Traditional Mexican Cooking), with a slightly different take. It takes 30 minutes and serves 10. Heat 6 tablespoons of oil on medium and sauté onion. Add the ground pork tenderloin, mashing and turning it in the pan so the meat is loose and is separated. Once the meat is browned, add the tomatoes, the slivered almonds, raisins, clove, cinnamon, and season to taste. Cover and cook over medium-low for about 15 minutes or until all liquid is evaporated. This meat mixture is called picadillo. Mix the lettuce with the parsley. In another pan heat 6 tablespoons of oil over medium heat. Fill the tortillas with a 2 generous tablespoons of picadillo and roll tightly. Depending on the pan size you use, you can fry two, three or four at a time. Add more oil if needed as you go. Place flutes on an oval dish or on individual dishes, 3 flutes if serving on plates, and garnish with lettuce, shredded cheese and cream. Place the hot sauce in a small bowl for each person to use as they please. Enjoy! Translated by Fernanda Becaglia and published at VOXXY. Many Peruvian dishes use potatoes, after all, there are over 7,000 varieties in Peru. 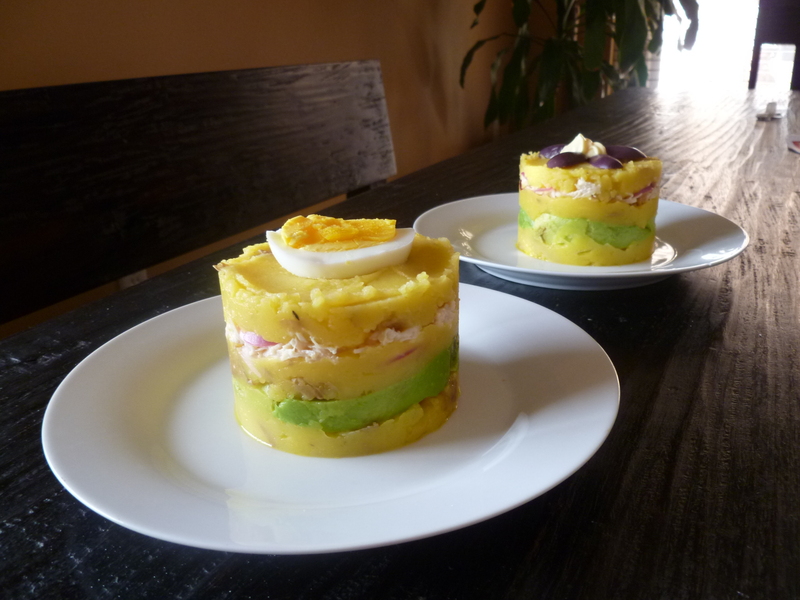 Causa Limeña is one of the most popular of the Peruvian potato dishes. This version also features chicken. Boil the potatoes in salted water until tender, about half an hour. Meanwhile boil the eggs, they must be hard, so they should boil for about 5 minutes. Put the onion in a bowl with the lime juice. In a second bowl mix the chicken with the mayonnaise and a pinch of fresh ground white pepper. When the potatoes are ready, mash them in a big bowl. Add the ají paste, and half of the oil, until everything is well combined. Add the lime juice from the onions, and the rest of the oil. Mix well. Mix the chicken with the onions. Place a small ring mold on the plate. Spoon a layer of the mashed potatoes into the ring. Cut the avocado in slices and lay on the first layer of potatoes. Spread a second layer of mashed potatoes, and then layer with the chicken. Cover with a final layer of potatoes. Pull the ring off the potato mixture, and garnish with slices of hard boiled eggs and/or black olives. 4 personal portions can be made from this recipe using a small ring mold, but a spring-form pan works well to make a single family-style portion. You can also use a casserole dish, but be sure to reverse the avocado and chicken layers, so the avocado will be on the bottom when you flip the dish to unmold the Causa. For an extra-spicy Causa, add another tablespoon of ají amarillo to the mashed potatoes. Published at Travel Curious Often and VOXXY. 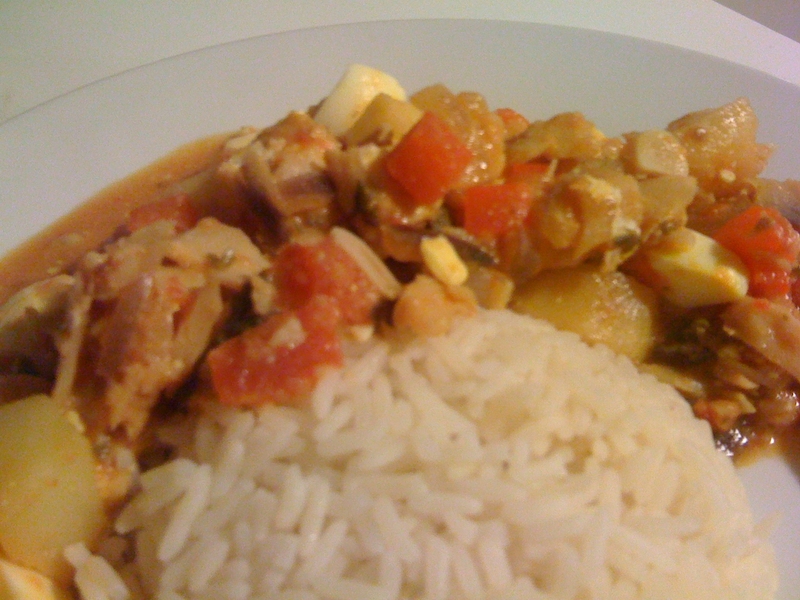 Aymara made this delicious soup for out Turkish cookout this month. 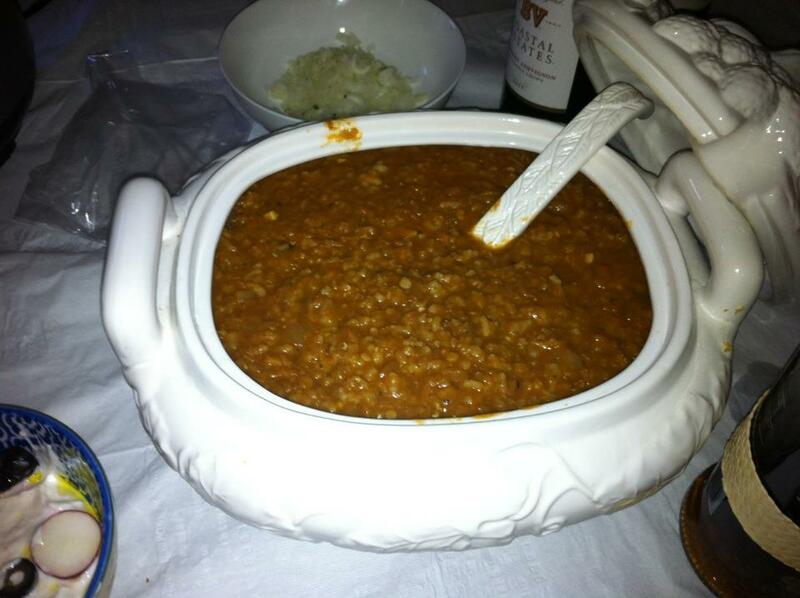 Lentils are a good source of iron and a great substitute of proteins for vegetarians. This recipe is very easy. Will take you 5 minutes to prepare it, and will be ready in 40. It serves 4. In a Dutch oven, or a heavy pan, warm butter or ghee over medium heat. Add onions and sauté for 8 minutes, or until onions are translucent. Stir in garlic, cumin, and coriander, and cook another 2 minutes. Add tomato paste, stock, lentils, rice and red pepper. Stir to combine and bring soup to a boil. Cover pan, reduce heat to simmer, and cook for 30-40 minutes, stirring occasionally, until lentils are tender, and the soup has thickened. Add salt, pepper and dried mint. Serve hot with lemon wedges on the side. 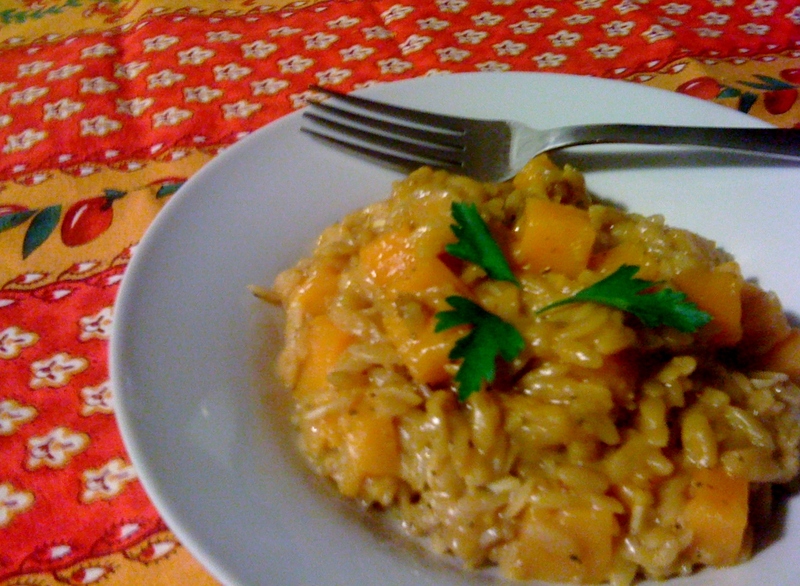 Orzo is very similar risotto. I got this recipe from Epicurious.com one of those days that I got home without any idea about what to cook. The results were amazing. Risotto remains a pending task for me, but I think this dish is a good start for my plans. Orzo is a form of pasta in the shape of a grain of rice, a little bit smaller that a pea but bigger that a lentil. It is usually used on soups. Since I didn’t have any fresh sage, I used it in powder form, because this recipe was a last minute idea. The results were great, so I think it will be much better if you use it fresh. Also, since I wanted to prepare a vegetarian dish, I substituted the chicken broth for vegetable broth. Peel the butternut squash and cut it into 1/2-inch pieces, getting rid of the seeds. It should make about 4 cups. Chop the onion, and mince the garlic. Melt butter in a large heavy skillet over medium heat. Add onion and sauté until tender, about 6 minutes. Add garlic and sauté until fragrant, about 1 minute. Add butternut squash and stir to coat. Add 1/2 cup vegetable broth and wine. Simmer until squash is almost tender and liquid is absorbed, about 10 minutes. Meanwhile, bring 3 1/2 cups broth to boil in heavy saucepan. Add orzo. Boil until tender but still firm to bite, about 8 minutes. Transfer orzo to large bowl. Stir in butternut squash mixture, then Parmesan and sage. Season with salt and pepper. If you like pasta al dente, drain orzo if necessary after cooking for 9 minutes. If you prefer it to be tender, cook it for a couple of more minutes, until all the broth has been absorbed. According to Raquel Roque in her book “350 Recetas criollas” ( published as The Cuban Kitchen in English) Elena Ruth was a spinster, the child of Americans living in Havana, Cuba. She used to attend the ballet, and after the show would go across the street to El Carmelo café (the one on Calzada Street, across from the Amadeo Roldán theater, I think although I am not sure) where they would make her a custom-made sandwich: half Cuban and half American. Every time she would arrive, the waiter would yell to the cook: “Here is Elena Ruth. Make her the usual!” Soon, the other patrons began to request the same, named the sandwich after her, and the legend was born. 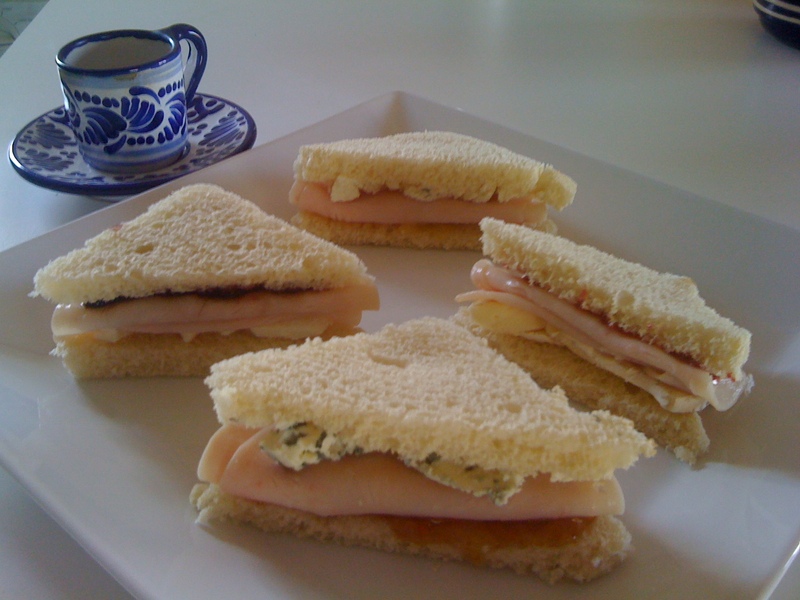 The one I liked best was the blue cheese and figs jam, but they are all delicious and better than the original. And I do hope Elena, wherever she may be, will pardon me for saying so. If you cannot find dinner rolls of the correct size, use regular packaged bread (of the Wonder Bread kind) and just cut off the crust. It has been a long time since I cooked this recipe learned from my mon, but last Saturday I decided to cook it again, this time using Chardonnay instead of cooking wine. The flavor is more delicate, simply delicious. The recipe serves 6. After soaking the cod (bacalao), it takes only half an hour to prepare. Some prefer to soak the dry cod for day, keep it in the fridge all that time and then cook it. However, it is good enough to soak it for two hours before cooking it, changing the water three or four times. It is not necessary to add salt to it. 1/2 large red bell pepper. Hardboil the eggs (about 5 minutes). Break the cod in small pieces, and season it with the Spanish paprika. Peel the potatoes, cut them in small cubes, and fry them without browning them. Peel the eggs, and cut in cubes (it doesn’t need to be in exact geometrical form). Heat the oil in a pot, and sautee the garlic and onion until the onions are translucent, about 2-4 minutes. Cut the garlic in slices before adding it. Then add the tomatoes (including the juice from the can), the wine and parsley, and let it all cook for another couple of minutes. Then add the cod, the fried potatoes and the hardboiled egg. Stir it well, cover the pot, and let it cook for ten minutes or until the sauce has the thickness that you prefer.